One of the weirdest concepts of them all. A box of chocolates in a bar. The only trouble was trying not to get a bit of the coffe cream in with your Turkish Delight. 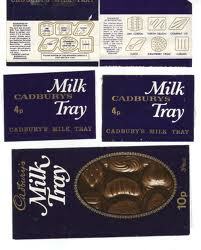 It was a moulded chocolate bar made up of chocolates from the Milk Tray Selection. Fillings included starwberry cream, fudge, lime barrel, turkish delight and hazelnut in caramel. Cadbury’s also did a plain chocolate version called Plain Choice.